World Down Syndrome Day approaches. This should be the busiest time for the blog. I have a list of websites I should be pitching articles to, so I can you know, raise awareness. Because even though things are looking good for people with Down Syndrome and we’ve come a million miles from the days when a diagnosis translated into a life hidden in the shadows of institutions, there’s still so much to do, so much educating to give, so many lazy stereotypes to be busted, so much more understanding to foster, equality to nurture, prejudice to dismiss. So I really should be doing something to address all of the above. But 2015 is not going according to plan. We’re in the midst of an ongoing and incredibly stressful house purchase where everything that can go wrong, seems to be going wrong. On top of this, there’s the fact that the state of my mental health is at an all time low and it’s not hard to see why I’m lacking motivation to hop on the awareness train and get the message out there. But this is for my darling Mini, so I’m digging deep and doing this for her. For those of you who are new to the blog and don’t know about her, let me introduce a true force of nature. 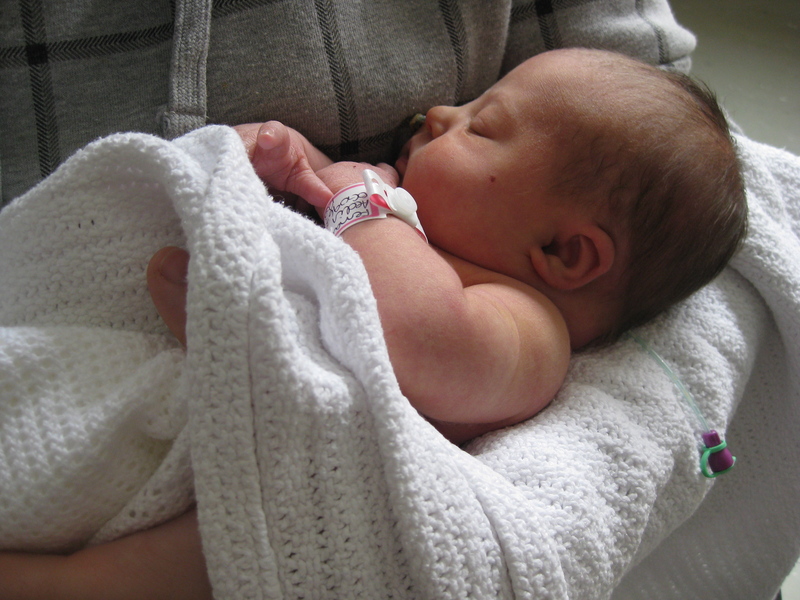 When Mini was born, she had feeding issues. She had to be fed through a tube in her nose. You can just about make it out in the photo below. 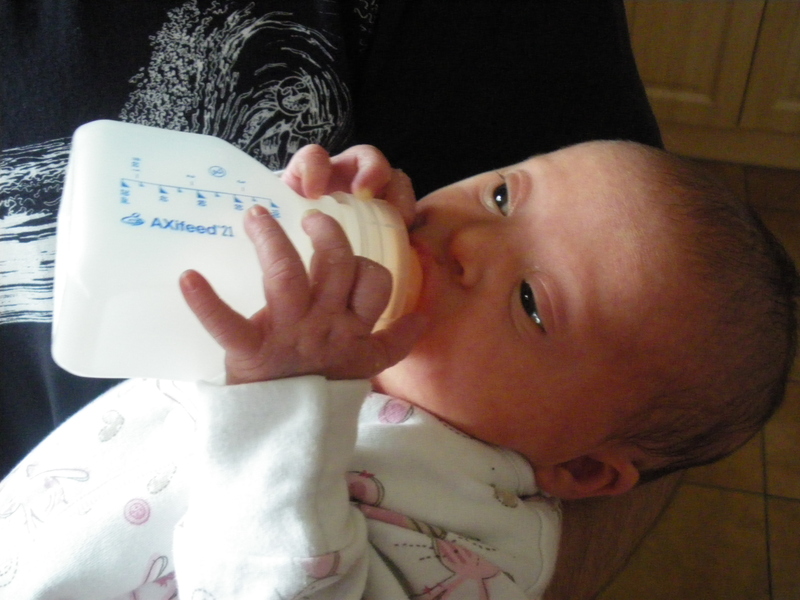 The doctors thought it would be several weeks before she would be able to feed through a bottle. They said she would never be able to breastfeed. She left hospital just 6 days later. Here she is at just 2 weeks feeding herself!She breastfed for 8 weeks. Her paediatrician said she there was a good chance she would not walk independently before the age of 3. 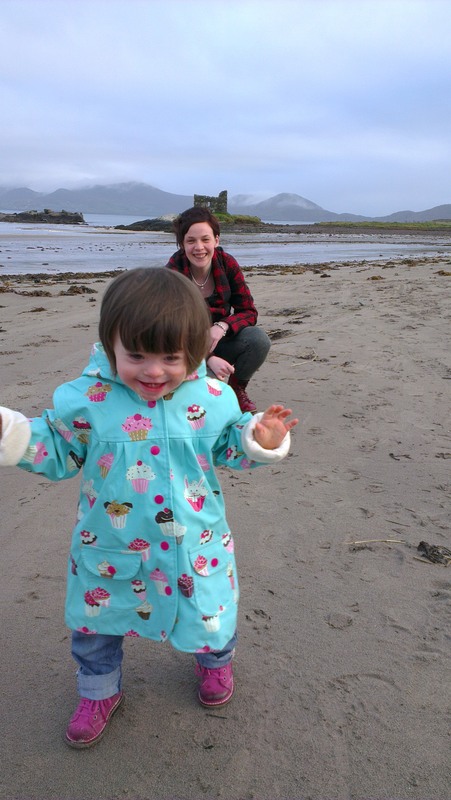 Here she is at 21 months, walking the beach in Kerry. We have been told she may never talk properly. She speaks three languages and ok, she doesn’t have a huge amount of words in any of them, but she’s getting there. Today I went to a birthday party held for her in her preschool. I watched the other children flock around her when it was time to give out her presents. I watched her show them some sign language. I watched her respond to her father in French and her teacher in English. When was the last time you spoke 3 languages in the space of five minutes? As for inclusion?Well four years ago, I was terrified she wouldn’t fit into society but everywhere she goes people naturally gravitate towards her kind and loving spirit. 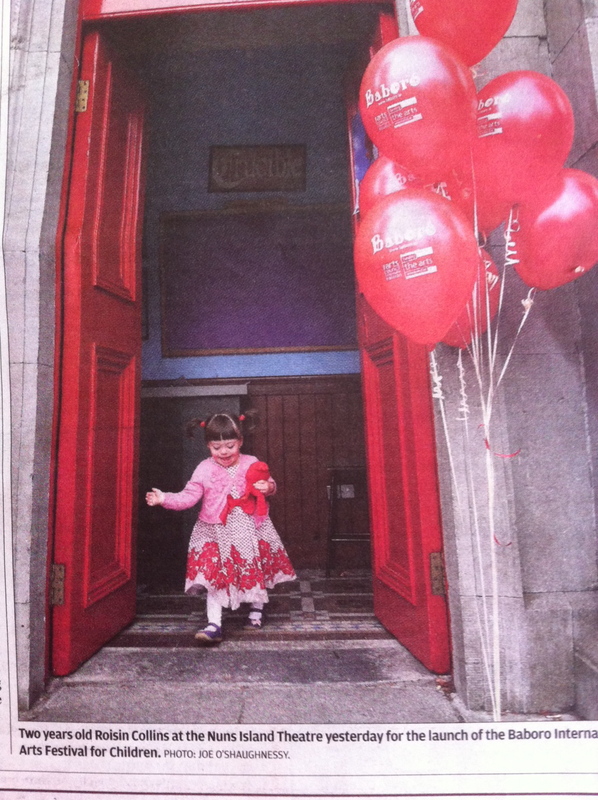 Here she is stealing the show at a photo shoot to launch the 2013 Baboró children’s Festival. There’s so much I have learned from her in the last 4 years. She continues to surprise and prove so many people wrong (me included!) on a daily basis. She is a running, jumping, laughing, dancing, singing human dynamo. She is smart, funny, cute, adorable, loving, impatient, brave, curious and unique. She is all these things and more. Down Syndrome doesn’t define her and it certainly doesn’t limit what she can do. So, to all the doctors and other members of the medical profession,don’t be sorry! To all the parents who have just been given a diagnosis, don’t be sad! To all the family and friends, congratulate don’t commiserate! Down syndrome is nothing to be scared about. It is one thing, it is not everything. 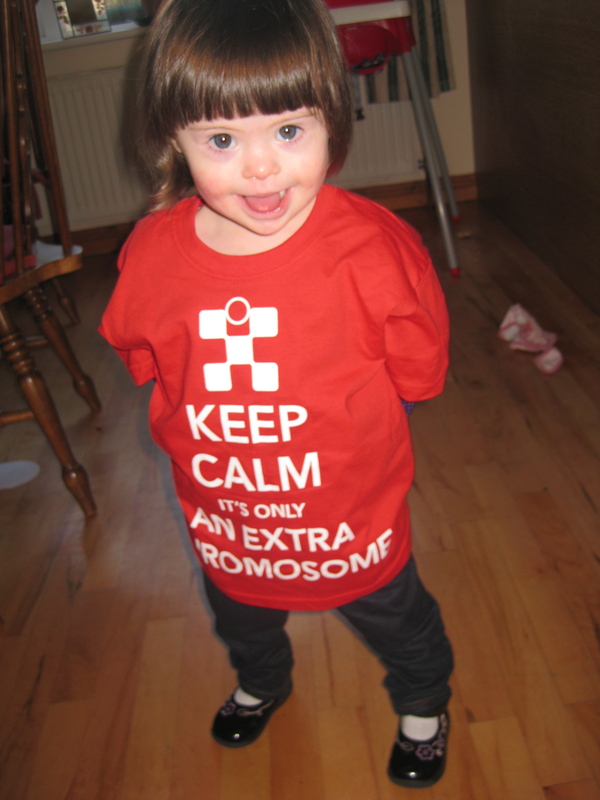 Keep calm, it’s just an extra chromosome!Happy World Down Syndrome Day 2015! World Down Syndrome Day 2015 is on Saturday March 21st. You can show your support for people with Down Syndrome by wearing odd socks, taking a foot selfie and sharing it on social media with the hashtag Footsie4DSI‬ and donating €2 by texting DSI to 50300. For our UK friends, you can donate £1 by texting SOCK57 to 70070. She is such a rock star and so are you. Loving it and sharing it. “It is one thing, it is not everything.” What a perfect way to put it. I can’t wait to put on my odd-socks intentionally for once! Ha ha!Yeah we rarely have matching socks in this house! Utterly lovely – Mini, and this post. I was going to rush out a post tonight, but then I read this. It’s a heartfelt post, filled with love by a great online friend of mine. Posted to remind us that World Down Syndrome Day is Saturday March 21st. Let me introduce you to four year old Mini, who happens to share a birthday with me. A little lady big on personality. Enjoy. Comments are disabled here, instead you can say what you think to Minis Mom on minisandmum. Thank you she had a fantastic day. Welcome to Holland by Emily Perl Kingsley I am often asked to describe the experience of raising a child with a disability – to try to help people who have not shared that unique experience to understand it, to imagine how it would feel. It’s like this… When you’re going to have a baby, it’s like planning a fabulous vacation trip – to Italy. You buy a bunch of guidebooks and make wonderful plans. The Coliseum. The Michelangelo David. The gondolas in Venice. You may learn some handy phrases in Italian. It’s all very exciting. After months of eager anticipation, the day finally arrives. You pack your bags and off you go. Several hours later, the plane lands. The stewardess comes in and says, “Welcome to Holland.” “Holland?! ?” you say. “What do you mean Holland?? I signed up for Italy! I’m supposed to be in Italy. All my life I’ve dreamed of going to Italy.” But there’s been a change in the flight plan. They’ve landed in Holland and there you must stay. The important thing is they haven’t taken you to a horrible, disgusting, filthy place full of pestilence, famine and disease. It’s just a different place. So you must go out and buy new guidebooks. And you must learn a whole new language. And you will meet a whole new group of people you never would have met. It’s just a different place. It’s slower-paced than Italy, less flashy than Italy. But after you’ve been there for a while and you catch your breath, you look around…and you begin to notice Holland has windmills…and Holland has tulips. Holland even has Rembrandts. But everyone you know is busy coming and going from Italy…and they’re all bragging about what a wonderful time they had there. And for the rest of your life, you will say, “Yes, that’s where I was supposed to go. That’s what I had planned.” And the pain of that will never, ever, ever, ever go away…because the loss of that dream is a very, very significant loss. But…if you spend your life mourning the fact that you didn’t get to go to Italy, you may never be free to enjoy the very special, the very lovely things…about Holland. Beautiful writing, beautiful girl, beautiful mama. Odd socks it is!